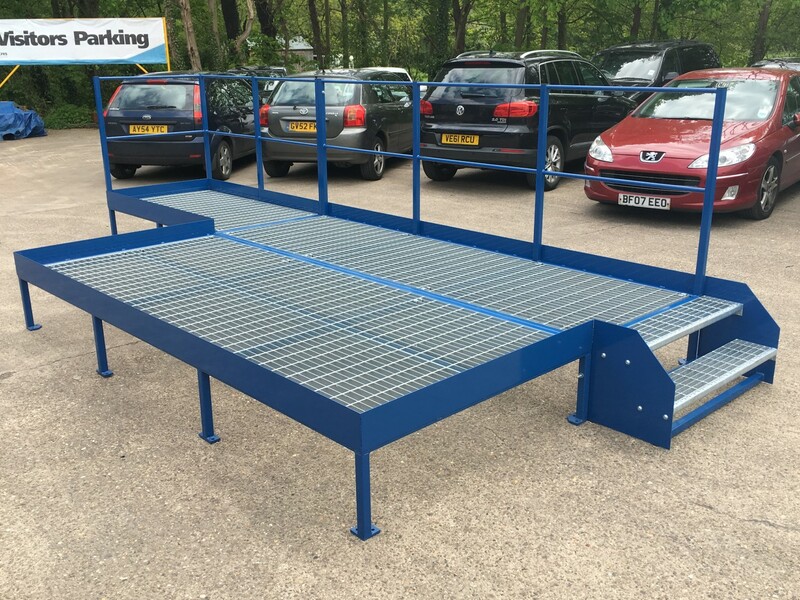 The CDS platform has been designed for a for a local Midlands client and will be used to provide access to new machinery within a new manufacture facility. The solution has been designed and manufactured from 40mm box section and clad on the top with a 30 x 3mm galvanised open grid floor and secured in place with bolted brackets for access. A 100mm kick-flat has also been added to all outside edges to prevent objects falling between the platform and machinery. To access the CDS platform two steps have been manufactured from open grid material have been added, along with a fabricated handrail from 33mm dia tube. An outer skirt has been created from 1.5mm mild steel which is fixed to the outer box section to prevent any objects entering under the platform. Mild Steel parts have been powder coated in Blue 20 D 45 to provide a hard wearing durable finish.